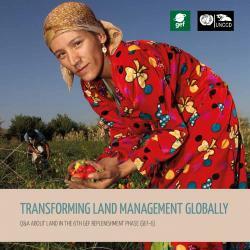 Combatting land degradation is a key component of the post 2015 development agenda. The linkage between land degradation and other global environmental challenges is more recognized than ever before. We must leverage the increasing attention being given to land to further promote sustainable land management and rehabilitation of degraded land as solutions to multiple environmental challenges. Addressing drivers of land degradation and delivering related action could also enable the land-use sector to be a substantial element in the intended Nationally Determined Contributions (INDCs) under a new international climate change agreement. Similarly, implementing sustainable land management at scale will halt the loss of biodiversity as half of the Aichi biodiversity targets rely on better land management. To spur action, GEF-6 funding has been made even more accessible to many land degradation affected countries, through the simplification of application and expedited approval processes. For GEF-6, a total USD346 million of the Land Degradation Focal area resources has been allocated to 144 eligible countries and a further USD85 million made available through regional and global set-asides, including UNCCD enabling activities. The GEF Financing for Enabling Activities under the UNCCD provided critical funding for the implementation of the Convention during the last GEF Replenishment Phase. Now the new Phase - the Sixth GEF Replenishment Phase (GEF-6) - has started, and we encourage countries to access this important funding opportunity for sustainable land management efforts. This booklet is a useful one-stop information source not only for the UNCCD National Focal Points but also for anyone who intends to design projects on sustainable land management for submission to the GEF. We hope that this booklet motivates stakeholders to take advantage of the multiple funding opportunities provided by the GEF.